Publisher's blurb: "The Monsters of Sin epitomize the very worst of our natures, and prey on others' weaknesses. Designed for GMs, this first book in the Monsters of Sin series for Pathfinder Roleplaying Game is devoted to Avarice: the insatiable lust for wealth. The monsters in this book are powerfully motivated by wealth, or they tempt player characters to make poor choices in the name of greed. 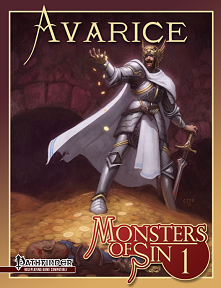 "Whether you're running a Campaign of Sin, or just want to add a little greed to your game, Monsters of Sin: Avarice offers a wealth of possibilities!"